Please check the shipping address listed in your paypal transaction as you check out! If that address is wrong contact me ASAP since I pack and ship orders quickly and I do it based on the address paypal gives me. I prefer you have a confirmed paypal address since unconfirmed addresses mean I need to confirm the shipping address with you (this takes time and can delay shipping.) If you get an e-mail from me with a subject like Re: Payment received from your e-mail@your e-mail.com it is me trying to confirm something about your order before I can ship, please open it and respond if you want your order shipped asap. I do not earn money on the shipping. The paypal calculator is not very flexible so if it over charges you for shipping, I will refund the difference. There is a place on paypal where you can add instructions about shipping (for instance if the shipping address is a business address according to UPS/Fed Ex it might allow me to save you money on shipping for certain products if I know about it, otherwise I have to assume residential shipping. If you add your phone number there I can use your phone number if I ship via Fed Ex for certain products and they can call you if there is an issue with delivery.) If Paypal doesn't charge you for shipping, it is probably because you are in another country or someplace I don't normally ship to, I will be contacting you about it since I will need to find out the shipping costs to your location and send you an invoice for the shipping or refund your order if I can not ship to you or if you don't want to pay the shipping. I normally Sell in the USA but have occasionally shipped packages internationally. Plants and Fish I only sell in Florida at this time and I am not set up to ship fish yet. I try very hard to quickly answer questions about products before the sale. If you are uncertain about a product please ask, I want to make sure that what you buy is what you need and what will actually work for you. If you buy a product and change your mind about it later and want to return it, I will have to charge a re-stocking fee and I can only accept returns on unused items. I can only make refunds for 60 days after the purchase through paypal. I do not refund the shipping or pay return shipping unless the reason for the return is on my end. Please contact me for instructions before returning anything. If I'm not expecting something to come back, I won't know what to do with it if it actually makes it to me. Some packages are shipped direct from the manufacturer and simply mailing something back to them won't get you a refund. If there is a problem with a product, please contact me so we can work something out. Some items are covered by warranty. I am available for help, consultation, and design services. Services start at $60 an hour for Backyard/hobby systems and commercial systems based on system scale starting at $120 an hour. I am actually a bit resistant to consulting on commercial system unless you already have experience at a backyard or hobby scale since farming is not something to go into without any experience. And aquaponics is farming, it is a lot of work, you can’t do it from your desk and if you ask me how long it takes for the plants to grow and expect a simple single answer, I’m likely to get a bit impatient with you about it. Here are some of the likely questions one should be ready to answer when seeking assistance with an aquaponics system. How old is the system? Has the system cycled up yet? How big is the system? fish tank size and often more importantly grow bed or bio-filter size. How many fish? what type and how big as well. Location of system and special circumstances? What is the light? As in sun, shade, indoors under what kind of grow lights and how close are they? What about the source water? treated, untreated, well water or rain water? If rain water what type of roof and tank? What type of fish feed? How often are you pumping and at what rate? Is there supplemental aeration and how much? And there are probably several other questions that could come up but this is what I’ve got to start. So, when starting a thread looking for assistance troubleshooting a problem with an aquaponics system, be ready to answer these questions up front in order to get the most help quickly. what is 200 minus 1? Hope you can help a newbie. I am setting up two flood and drain beds that will both work off of the same 160 gallon fish tank, a 100 gallon sump and two separate swirl filters each 15 gallons. The first bed is 20 square ft. with a divider down the middle, using two bell siphons. The other bed also is 20 square feet that is divided into 4 beds. Also using bell siphons. I will be using river gravel for my media. I am hoping to fill then drain each bed separately twice each hour using separate pumps in the sump. It is set up where the pumping of water begins in the sump, then goes into the swirl filter. The filter will have an overflow into the bed through a 1″ pipe. After filling, the bell siphon will drain into the fish tank. It will have an overflow back into the sump. It is my hope that the first bed will fill and drain within 20 min. Leaving the sump full again for the second bed to fill and drain. Each pump on a timer. First of all….will it work! and if so, what size pumps should I expect to use. The distance from the bottom of the sump into the swirl filter is 6 ft. Is it even possible to do a timed fill and drain with this set up or should I just plan on running it continuously hoping that they will all siphon at different times. I don’t want to run my sump dry. Please help!!! I’m a bit confused about your description of beds with dividers. What sort of dividers? Will they actually keep the water from flowing through the entire larger bed? I would probably say skip the dividers a 4′ by 5′ bed is certainly possible to flood and drain as a complete bed. I do not recommend using siphons and timers together. Multiple timers and pumps are usually not a good way to sequence flow to grow beds either unless you have a controller that can ensure that the timers don’t get out of sync. Also if these will be media beds, why are you using swirl filters? They would only be necessary if you are keeping a very large amount of fish. I would recommend taking a step back from the design and trying to simplify it as much as possible. Timed flood and drain with a sump tank of sufficient size is quite simple. But two 20 cubic foot grow beds would be a bit much for your 100 gallon sump so your options include. 3-use a bigelow brook farms controller to alternate between two pumps doing timed flood and drain. The beds are built from 2×10 lumber and plywood. We divided the beds for support. (couldn’t think of any other way to secure the sides in order to contain the weight). Each bed will be lined with pond liner. At this point getting a larger sump is not an option. The sump and fish tank are both buried in the ground. (hoping to off-set the high temps in the summer since living in the desert) Maybe I could pump from the FT also. Not sure how a sequencing valve works. Can you explain how constant flow works. Might take your advice about the swirl filters and only add them if my fish load gets heavy. So if the beds are actually lined separately as in built as a series of boxes and each box lined with it’s own plumbing and complete liner then think of each compartment as a separate grow bed. The Indexing Valves (I have an animation on this page) Can flood one bed at a time (using stand pipe and timer type method, skip the siphons.) They do, however, require a pump that is strong enough to operate them. Smallest pump I’ve managed under low head with the 1 1/4″ gravity modified valve was a 1000 gph pump with relatively high head capabilities. Otherwise, I generally recommend a 1800 gph pump for indexing valve operation under most conditions. To do constant flood. Simply skip the holes around the base of the stand pipes and skip the bells. Beds will all run flooded and as long as you have enough water flow through the beds all the time and good aeration in the system otherwise, this actually works relatively well for most types of plants. 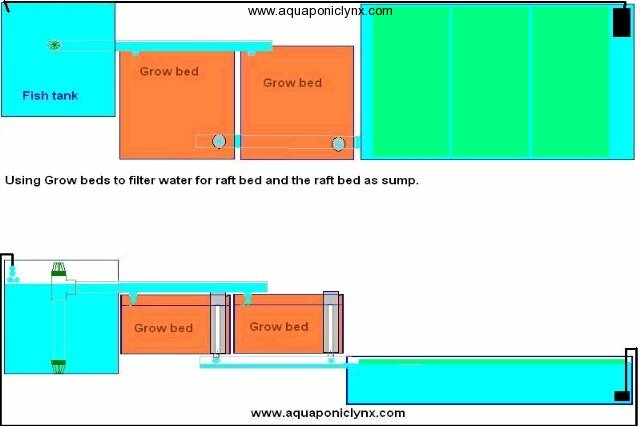 You might set up so that you can run one or two of your beds with siphons (however many you sump can handle the fluctuation from) and leave the rest as constant flood (beds you run constant flood will have to be filled up with water in addition to whatever water is in your sump since they will not drain and they will essentially be adding more water to your system and they will also reduce the amount of water temperature fluctuation in the system during extreme weather. I bought a 275 gallon IBC to make an aquaponics system. I was planning to cut off the top, flip it over and use the top as the grow bed and the bottom as the fish tank. I was planning on placing the bottom half of the fish tank below ground level and build a greenhouse around the whole thing. The local fish here is bass, crappie, and catfish. We live in agriculture zone 6B and it gets above 100F at times in the summer and down to 0F at times in the winter. What would be the best fish to grow? Is a sump necessary? Is a filter necessary? I suspect the fish tank portion will hold approx. 150 – 190 gallons. What should be the pump volume? Should a bell siphon be used? Thanks for helping a newbie. Well with only around 150 gallons of fish tank you are not going to grow really large fish and with only the top of the IBC as a grow bed you will have a very limited amount of filtration and the amount of fish you grow is going to be very dependent on the amount of filtration you have. I would say about 12 fish if you do the top at about 12 inches deep. Best fish, hum, I would probably recommend Bluegill or sunfish, Bass might be ok but I don’t know much about raising them in tank culture. I know nothing about raising crappie. Catfish are a great choice but I would probably recommend bullhead for such a small tank since channel or Blue Catfish get pretty big and that tank would be a bit restrictive in my experience. Though I do know people who have raised catfish in IBC tanks. For just that small system, a sump is not necessary. A gravel grow bed is your filter. If you want to grow more fish than your grow bed can support, then you need to add additional filtration. If you add more grow beds, then you might use your existing tank as the sump and add another full size IBC as a fish tank and do a CHIFP PIST or CHOP system. If your fish tank is up to 200 gallons, you need to find a pump that will move 200 or more gallons per hour at the height you will be pumping. That means that you need something bigger than a 200 gallon per hour pump. If you run the pump constantly you could use a bell siphon or some other type of siphon. Or you could do timed flood and drain using a timer (if you do that you need a pump that will move the volume of your fish tank at height, in the portion of the hour you will have the pump on. As for the temperatures in your zone, if you want to keep a greenhouse with a fish tank operational through winter, you will likely need some heating to keep the water from freezing and greenhouse from icing shut. Make sure the greenhouse can open up nearly completely or that it has some automatic vents and fans for the warm season. Sinking the fish tank part way into the ground may or may not be a benefit, it would depend on your choice of fish and your local average ground temperatures. Make sure you do something to keep the sides of the hole and the dirt from crushing the sides of the fish tank in. Moist dirt is heavy and an IBC tank is not strong enough to hold it back on it’s own. Be sure to keep the top edge of the fish tank high enough above ground level so you don’t get a heavy rain washing ground water into your system. Thanks for the information, it was very helpful. I still don’t understand what advantage a sump is, could you explain? a foot deep IBC bed of media is going to filter enough for about 16 fish (starting small) that will grow out to eating size in a brand new system. Each 3 square feet of raft bed give you enough bio-filtration surface area for another fish. I don’t normally count NFT in calculating bio-filtration since you really need filtration before you send water to NFT so the plants in the NFT may use up nutrients but they won’t really help you in having enough filtration for more fish. So for the system you are describing with and IBC media bed and an IBC raft bed, I would say only stock 20 fish for the first season. If you really are an expert fish keeper then maybe you can handle more but I wouldn’t in a brand new system. I expect your biggest issue is going to be lack of light. T12 shop lights are not going to give you impressive growth unless you basically hook together enough of them to totally match the footprint of your growing space and then place them with the tubes about an inch away from the leaves of the plants. So over a 42″ by 48″ bed you would likely need a minimum of 8 tubes just to get mediocre growth out of lower light demanding plants. And with the florescent lights you have to put them very close to the plants so you can’t grow plants of a variety of sizes under the same light fixture. But please don’t take my word on the lighting, I really have very minimal experience growing under lights. Jesse Hull of Imagine Aquaponics has plenty of experience with indoor growing and the lighting most effective an cost efficient for it. He is doing aquaponics indoors in Wisconsin. As for plumbing and layout of the system. I would personally avoid the two pump scenario. I would be more likely to cut one IBC in half, elevate the bottom of it as your media bed and have it drain into the top have that is sitting on the floor and acting as the sump tank/raft bed, leave one IBC full size as the fish tank and then have it drain CHIFT PIST (constant height in fish tank pump in sump tank) fashion into the media bed. pump from the sump/raft up to the NFT which can then drain back to your fish tank, excess flow from the pump can go directly to the fish tank as well. However, I don’t know if this layout will fit in your space. I don’t have any experience with muscles or prawns. Prawns require much space per creature so even if you stocked several you may find you only have one or two grow out in a IBC sump or raft bed. Duckweed may help use up ammonia and nutrients and allow you to grow more fish but I don’t think it will help you much in feeding your fish, especially if you also want to grow lots of veggies. Thanks for the input! I will look up Jessie Hull for some lighting advice. I was planning on (3) two bulb shop lights over both grow beds and additional ones over the later NFT. Having the grow out bulbs hasn’t been that big of in issue for the people I know that do them, with actual grow out Flourescents tubes in fixtures. Don’t know if I would even try things like tomatoes that need bigger light requirements anyway. I will be stocking less the first year esp since I will have less filtration than I thought. basically, I want the raft and nft for food production, the media GB is really for filtration so nothing gets wasted and for the taller plants like basil and swiss chard so my lights will be at more similar distances for the plants. I think everyone that successfully raises for than 25 fish in an IBC has swirl filters or other which I really not a fan of. I really don’t have room for the system you suggest since I won’t be able to use the sump as a raft under a media bed (no room for lights between). So with the space I think I will have to stick with the two pumps and keep my fingers crossed. Since there is a constant in and constant out, of the fish tank, hopefully I will be able to adjust the flows to match. The flow in and out of a raft back to the fish will be stronger then the flow into the media bed to supply the sump, so if I can’t get the flows to work, I will have to adjust the design of the nft to either pump from and drain to the sump or use one of the two outlets from the raft to supply the NFT and drain to the sump. I am thinking the later? But that might make a nutrient deficient sump that supplies the raft and NFT. So, could I add just like 2-3 fish in the sump? then If I grow duckweed, it would be have to be done in a sepparate tank. Yes, the duckweed and worms will be just supplemental feelings for the fish. In my recommendation of using the sump as a raft bed, I wouldn’t put it directly under the media bed. of course that picture isn’t based on an IBC as the sump tank but imagine if there was only one media bed and then the other half of the IBC was just lower than the media bed but off to the side so you could float the raft on it and hang lights over it. sorry then I misunderstood you. you must have missed that I have to work it in to about a 5 X9 space against the wall so I assumed you meant stacking them. If I had a little more room, that would probably be the way to go though. I will have to keep my tanks like I have planned and if you have any thoughts about my original post on size of plumbing, pump size and thoughts on where to put the nft and where the plumbing should come from and go to for them that would be great. Thanks! In that case I would probably recommend you simply run the two tanks as two separate systems. Skip the raft bed and make it a media bed. Pump from the fish tank to the media bed on top and let it flow back down into the fish tank. Then if you still really want NFT, I would say add some form of little bed or filter in front of it and hook it up to one or the other of your systems. Or you can try it the way you propose. I do not think you will need any fish in the sump, you really want to keep the sump as clean as possible so that you don’t gunk up the NFT pipes. Good Luck with it whatever you decide to go with. All sorts of plants do well in the tropics. Look for warm weather crops or seeds that you plant after all danger of frost has passed if you were in a temperate climate. try different things to see what works and to find what you like and will use. I would say start off with a basic flood and drain media bed type system, they are generally easy for a home system. I would also recommend at least 300 gallons of fish tank so that you don’t have to worry too much about water temperature fluctuations or the tank getting too hot during the day. Hi Ron the island average temperature is 84F. One of the best crops for the system is lettuce. I am planning a 60-75 gallon FT system. Let’s just go with 75 gallons for sake of answering my questions. If I started with a 1:1 GB ratio until everything established itself then bumped up to a 2 GB to 1 FT ratio… what do you think a good system would be for me? I’ve had people suggest flood and drain and constant flow. I plan on using hydroton for a media. I’ve also spoken to a tilapia breeder about a humane amount to keep in that size of a FT so I have that all sorted (I know all that depends on feed amount and what my system can handle not how many I can fit in a certain amount of gallons). Right now I’m just figuring out the system itself and am looking for advice. People have said I wouldn’t need a sump while others say I would to keep a constant water level… any input would be greatly appreciated! Remember that when you use water from your fish tank to flood and drain media beds without having a sump tank, you can go up to about a 1:1 ratio and only fluctuate about 40% of the water volume, be sure to keep that in mind when planning your system. If you go to a 2:1 grow bed to fish tank ratio you will need either a sump tank, some way to mitigate water level fluctuation or to do some beds constant flood. A 60-75 gallon fish tank is not very big for growing edible fish and for tilapia you will definitely need to make sure the temperature for the tank will stay stable. This probably means having it indoors (and then you need lighting for the grow beds) or if outdoors you will need heating and cooling for such a small tank depending on the time of year. Running constant flood may be a good idea with such a small system to mitigate water temperature fluctuation. They would definitely be indoors. I like flood and drain for the airation plus I’ve thought about adding worms to the GB. I’m not too fond of the bell siphons because of all the problems I’ve heard about them clogging, etc. I’m aware that a timed system would make the pump not last as long. I would probably end up doing a sump tank then so that I know the actual amount of gallons in the FT instead of it draining on them. I definitely prefer the idea of constant levels over fluctuating ones. Are there really even any advantages of constant flow over flood and drain? From everything I’ve read it seems like flood and drain has so many positives. I’m aware I couldn’t keep many tilapia and I know they need to stay warm. I’m not trying to pump out a ton of fish, I’m doing this smaller version before I move into a house and go bigger scale. no water level fluctuations, more stable temperatures, and constant pumping without worries about balancing the siphon. wider range of plants seem to like it better and the wet/dry seems to help the worms keep up with the solids and old roots. Less worries about stagnation or anaerobic spots in the grow beds. Sump tanks also add to the total water volume in the system and thus help improve temperature and water quality stability. For small systems siphons are really not that hard but turning small pumps on/off is not as terrible as it is for big pumps. Keep in mind if your pump is only running for 15 minutes each hour, you need to filter the volume of your fish tank in only 15 minutes and you probably want to add additional aeration if you are doing timed flood and drain. And for growing edible fish in such a small tank, I would run additional aeration no matter what. Yes I would definitely have the additional aeration regardless. So based on the size of the system… Do you think it’d be better to go with a bell siphon or a timer? How big are your grow beds going to be? Will it be just one or several? How do you feel about water sounds? What size is the pump going to be? See if you have a pump that will only move 100 gallons an hour at the height you will be pumping, you probably need to have the pump run constantly and should go with siphons. If your pump will move 400 gallons per hour at the height you will be pumping, then you could probably get away with running it on a timer. If you find you are not circulating enough water, you can always just run the pump constant, just make sure the stand pipes in the beds are big enough to keep the bed from overflowing. Always make your stand pipes accessible/removable for cleaning and adjustment. Well a GB with dimensions of 42″L x 29″W x 12″D (60 gallons) would be sufficient for a 60 gallon FT? Correct me if I’m wrong. Because that would just make it a 1:1 ratio. I figured I start with 1 GB then as the system gets established and the fish grow, add a 2nd GB to help with filtration. After more reading I think I want to do either all CF with it draining maybe once an hour or 1 CF and 1 timed drain. Are there any issues in either of those systems? Water sounds do not bother me and if need be there’s an entire room they can have to themselves. 60 gallons of grow bed is sufficient for about 8 fish that might grow out to 1 lb each. If you add another grow bed you then need to make sure you have a sump tank or some other means to handle the water level fluctuation. When you say CF, do you mean constant flood or constant flow? If you are doing constant pumping and have a siphon in the bed it is likely to flood and drain more than once per hour. If you are doing timed flood and drain you will more likely be running the pump for only a limited time and then letting the bed drain while the pump is off. Now if you really want, I can sell a timer that is made to alternate the function of two separate pumps so you could have one pump flood one bed then turn off and then the other pump flood the other bed. If you are going to run one bed constant flood or constant flow with a siphon and a separate bed on timed flood and drain, you will need two pumps. Yeah I am not one of those people who wants to super stock the fish. I would only have enough to keep the plants happy, etc. I just assume that started with 2 beds is probably not that great since everything has to cycle and establish itself and the plants all need nutrients. Would you say it doesn’t matter? And sorry I should’ve clarified. I have been thinking about going with constant flood. Or possibly one bed constant flood and one bed timed flood and drain. I don’t care if I have more than one pump. Well, having both beds from the beginning will allow the bacteria to cycle up in all the media so from that stand point there isn’t a benefit to not installing both beds from the beginning. Just because you have the beds doesn’t mean you have to plant them both from the beginning. And if you cycle up fishlessly, you will have plenty of nitrates for leafy plants from about 3 or 4 weeks into cycling. If you cycle up with fish it may take a bit longer but most plants don’t need very much as seeds and seedlings. That’s a good point. Then that would definitely be smarter. Let everything establish but only plant in one bed until everything moves along more and there’s more nutrients available for more plants. Plus it’ll help with filtration for the fish as they grow. Everything that I’ve looked at that I want to grow seems to all do well in constant flood… so I’m wondering if I should even bother with timed drain? I’m still debating. What would be the differences in the system requirements if I did 2 constant flood beds or if I did 1 constant flood and 1 timed drain? I do definitely appreciate all of your input! Constant flood is actually a goo way to go for brand new systems (provided you have enough tank space or a sump, you can always change over to flood and drain later.) Constant flood actually cycles up quicker. Major key to successful constant flood is you do need plenty of aeration to make sure the water going into the grow beds is well oxygenated since the bacteria and plant roots in the beds need dissolved oxygen too and since the beds are not draining down, your water has to provide all the dissolved oxygen. The flow rate through the beds also needs to be enough to keep things nice and fresh not only for the fish but for the plants/bacteria in the beds (again because it isn’t draining) you need constant FLOW to go with the constant flood. If you build the beds with a removable stand pipe, you can always swap to a stand pipe with holes for timed flood and drain or adjust the stand pipe height and add a bell do do siphon flood and drain. Many people who do flood and drain will sometimes switch over to constant flood either by leaving the pump on always or removing the bell from a bell siphon to run constant flood for a time. This can often help cycle up, recover from a water quality (ammonia or nitrite spike) issue or even help mitigate wild temperature swings during certain seasons. So if I went with a 60 gallon FT (I actually found one I like that will be durable enough that is… I believe 86 gallons? I have the specs at home. So I figured I could do about 75 gallons filled for the FT and then do 2 constant flood beds. Would it be fine if I just stuck to the 2 grow beds of 42″L x 29″W x 12″D (60 gallons) or should I look for new beds that are 75 gallons each? I have also read the trial about starting with constant flow being the better route to cycle and establish your system which was part of the appeal of constant flood. So if I decided to just go with constant flood for both grow beds would I still need a sump? I know I would need aeration. So keeping in mind the specs I’m planning on using (75 gallons of water in the FT and either two 60 gallon GB’s or bumping up to two 75 gallon GB’s) what size of pumps would I require? I feel like I see pretty general rules on this but I’ve also seen some people with different input so I just like to be sure with people who obviously have success in what they’re alraedy doing. If you keep your stocking reasonable you should be fine using the 60 gallon grow beds. You are right it is just general rules of thumb. If you are doing this indoors using lighting, you may find that your limiting factor is having enough light to let the plants make full use of the nutrients and so you might need to limit your fish stocking or the amount you feed them in order to keep up with the nutrient levels without having to change out water. It is all a balance you will have to sort out thought experience and time since there are so many factors in every situation. If you will ALWAYS do only constant flood and never expand to more grow beds, you don’t necessarily HAVE to HAVE a sump tank (however this will mean you can probably never drain your grow beds down since that would overflow your fish tank.) The sump will add some stability and flexibility to the system but is not mandatory for a constant flood system. Okay well right now my current thought (I am still going with subsurface continuous flow) is to do one system but with 2 fish tanks instead of just one. I think it’d be more convenient. I would also have a sump tank for additional aeration, filtration, and for the flexibility of changing the system if I’d like. That way I can also shut off one FT if need be for cleaning/quarantine (whatever the case may be) or even have 2 different age groups of fish going at the same time. Do you think it would be best having each FT go to each separate bed (I’d have 2 or 4 beds) or have the 2 FT’s end up connecting their water flow in the pipes and from there going to the GB’s? Sorry if that’s not clear enough, I can elaborate if need be. Either way can work, do what ever makes most sense for the plumbing layout in the space. Just make sure the flow through the fish tanks is enough and the pipes are big enough to handle the flows. I’m new to aquaponics, and hoping you can tell me if the way I was thinking of setting up my system has merit. I was thinking about keeping my fish tank(s) in the basement, and keeping my grow beds outside next to my house. My reasoning is that I could keep the fish and water at a more even temperature, possibly allowing me to raise trout in the future. I also believe that I could get away with a much smaller greenhouse, or even cold boxes, for the grow beds which would be easier to build and heat during the winter months here in Connecticut. Do you see any issues with setting my system this way? Hi Rob, I expect there will be issues with setting up a system that way, However, I think it probably could be done providing you think carefully about the issues. 1-Humidity involved with having fish tanks in your basement. 2-Supplemental Light and heat for your plants in winter. 3-Mitigating excess heat from the plant area in summer so the trout don’t get too warm. 4-you may want to provide some extra bio-filtration/solids extraction for your fish system inside so that perhaps you only exchange the water between the Plant portion and the Fish portion when temperatures are appropriate. Basically make two separate systems (a micro fishfarm in your basement and a organic hydroponics system outside) that can each cycle separately when needed but can also be tied together when conditions are suitable. Pumping up out of a basement and draining back in will involve a bit extra but I’m sure it can be done. Make sure the location for your plant beds has ample sun and in winter you may really need some supplemental lighting to keep certain types plants from building up toxic levels of nitrates which can happen under really low lighting conditions in cloudy winter upper latitude climates. will you be having any classes in the orlando fll area anytime soon? Im building a system that will have 20 grow trays that are 4′ x 32′ which will give me 2,560 sf of grow space that are 6″ deep (actual ) with media not counting 2 inches above the grow area. I have 4 – 275 gal IBC containers I’m using for the fish tanks each that are on index Vavles. Would the 4 tanks be sufficient or do I need more? Also is there a rule of thumb to figuring the ratio of fish tank to grow bed area for future use? I’m growing lettuce only. a rule of thumb for a new or backyard system is that you want at least a cubic foot for gravel bed per fish that will grow out to 1 lb. You don’t necessarily need that much fish though, especially if you are only growing lettuce. You may get away with only 1 lb of fish per 3 square feet or more of lettuce growing space if you fish are consistently eating year round. Is that enough fish tank? Well that will depend greatly on what you do, what climate you are in, kind of fish, temperature you keep the water at and your additional filtration, and aeration. It is a hard question to answer without more details doing some math to go with it. Do you consider yourself an expert fish keeper? I have an existing DWC system that has a grow area of 2600 sq ft. I want to add a gravel media bed before the 1st trough and use the wicking matting on top of the gravel to facilitate my seedling trays and my microgreens. This gravel bed would be 2ft wide x 50ft long x 20inches deep. I plan to use 12 inches of gravel with the overflow pipe entering the first trough with the DWC rafts. 1)Can this be done as a constant flow bed or must I use a bell siphon here? I was trying not to use a bell siphon because I think given the volume of water to be drawn out may be too much for the trough and may overflow. 2)If I make it as a constant flow,should I place air diffusers mid-way through the gravel @ 5′ intervals? I would recommend timed flood and drain for your seedling bed or table. I would also recommend deeper gravel if you can manage it while still being able to flood between 1/2″-1″ of your plug trays. Also, smooth gravel will harm your seedling roots the least when you pull the trays for transplanting. Deeper gravel will provide more temperature stability while also providing some extra filtration for your system. I use some capillary matting in trays where I grow shoots and micro greens but I don’t like to use it under my seedling trays anymore since I’ve found that flood and drain seems to work SOOOO much better for the seedlings. My 1/2 gravel beds where I put my seed trays after they germinate get flooded for 10 minutes every two hours. Uh, why do you need 20 inches deep for seedlings and micro greens? the beds I’m using with the seed trays are overall only 12 inches deep and I have them able half full of gravel and I flood over the top of the gravel only about an inch. If you have 2″ deep seed trays and 6 inches of gravel you could do fine with an 8″ deep bed or if you want 12 full inches of gravel depth for the filtration, then you really only need a 14-16″ deep bed. If you flood much more than 1″ over the top of the gravel you will have issues with washing out your seedlings. While this could be done constant flood, I find my seedlings do better in timed flood and drain. This might also work with a siphon but again, I’ve had far better luck with timed flood and drain for the seedlings since in a siphon situation, the plants near the water inlet might as well be in constant flood, especially if you use matting. While I love the matting for certain things (like putting it inside the slotted trays for micros, It doesn’t seem to work well under the trays since the seedling trays with soilless media don’t seem to be heavy enough to force media to matting contact with the tray interfering and if you are trying to do it on top of gravel, I don’t think you will get good matting to media contact through trays at all so you would have to be flooding over the matting which will basically defeat the purpose of it in the first place. I’ve done two 10ft x 4ft wide wicking beds and the micros are doing so well in them. I’ve used gravel in the reservoir covered it with a piece of weed mat and recycled my coir/vermiculite mix(retained after harvesting plants)as the grow media. This was my original intention for this long 2’x50′ grow trough. The reason that i’m going 16″ deep is to facilitate the gravity flow into the ist DWC trough as this is 13 inches top to bottom. What i’m trying to achieve is greater BSA because my fish stocking density is high. I’m also breeding Tilapias. Please advise. also,could you give me some info on the best way to grow the microgreens? Actually, I’m still trying to learn about the best way to grow microgreens myself so I don’t really feel all that qualified to answer that. I do know that when growing seedlings in plug trays or micro greens in flats that simply placing those on top of capillary matting when the bottoms of the trays are not getting flooded doesn’t really help. Now doing a recirculating wicking bed is a different matter but you still want to make sure you won’t be over watering your media in the top layers and I do not think constant flood is the way to go since it would all stay too wet. Ok it sounds like what you are doing is a bit different than what I was picturing. So you are kinda wanting to create a recirculating wicking bed of sorts? And not using Trays for your micros but simply growing them in the recycled grow media in the top of the wicking bed? The reason that i’m going 16″ deep is to facilitate the gravity flow into the ist DWC trough as this is 13 inches top to bottom. Does that mean the bottom of the new grow bed will be the same as the bottom of the DWC bed and you are just making the media bed higher or something? Or will the media bed bottom be higher than the top of the DWC bed? I believe to get much real benefit from the BSA of the gravel, you really want the gravel to flood and drain. If that will be too much water level fluctuation for your DWC bed to handle, I would recommend dividing your media bed up into smaller sections and doing a sequential timed flood and drain to them so that your DWC bed will still have an almost continual flow to it while the media beds will get a little dry time while still getting regular flooding to allow the bacteria to do their work. I think that if you run a wicking bed constant flood it will stay too wet and probably will run into anaerobic problems and won’t benefit you as much as a bio-filter. Unfortunately to do sequential flood and drain of many beds does cost extra to run the plumbing and automated valve and the indexing valve but it does provide great plant growing conditions at the same time as providing good solids handling and Biological surface area without sliming up a single grow bed inlet as bad. wanted to send u a sketch but here is not accepting the pic. anywhere else I can send it to u? I sent you an e-mail so you can attach a pic and e-mail me back. Having read how system sizing and fish are linked… what if? what if we cut just the tops out of our 275 gallon totes and fill with media. i see most folks cut these in half. I have, by luck, been given a 2000 gallon plastic tank for the fish abd MANY of these totes. We are planning to build a system to support 500 1 pound fish. ( at the cubic foot per fish calculation ) Adding to this later 15 X 50 X 12″ cement block area with liner. Is this correct or is the media depth need to remain around a foot deep for the totes as well? Do you HAVE to have that much fish for a system. No problem as they can be bartered. SOLAR BACK UP or a back up generator is a must and not enough sites mention this. So are you talking about just filling the tops of the totes with media? That really doesn’t give you much filtration. Or were you saying to cut open the tops and fill the entire tote with media? I know of some one who has done that download the IBC of Aquaponics and look for Outbackozzies system. Grow beds do not HAVE to be 12″ deep. That is just convenient for calculation and it does happen to be a fairly good depth to have good filtration for flood and drain or even constant flood. Shallower beds can work but will have some of their own drawbacks, deeper beds also work but you do wind up with less planting space. It will all depend on what your crops are and what your goals and priorities are. Now you don’t necessarily need a huge amount of fish, it really all depends on the climate, crops, type of fish, type of fish feed and many other things to figure out what exact ratio will work. Truth is there are tons of different ways of doing things. If you are removing the solids via, settling tanks, swirl filters etc, then you actually need more fish and more fish feed to provide the nutrients for the plants. If you are not removing solids you need to be more careful of not getting anaerobic pockets in the system that can really mess things up but you won’t need as many fish to support a large amount of plants because you are retaining more of the nutrients within the system rather than disposing of them outside the system. Also the balance that works with tilapia in one climate might be way different than what works in a different climate and if you are using trout, bluegill, catfish or something else, you may find a totally different balance works well. In my old backyard system I had lots of 24″ deep grow beds. I liked to stock 1 channel catfish per 10 gallons of fish tank and I had 20 gallons of gravel bed filtering for that 10 gallons of fish tank. To me that was the 2:1 ratio of grow bed to fish tank and that system did rater well even through I had a bad choice of media that kept the pH too high (7.6.) That was a good backyard system for channel catfish and I used lots of 100 gallon rubbermaid stock tanks. If I had a huge supply of totes, I would probably cut them in half as grow beds just to get a bit more planting space and so the tops of the grow beds wouldn’t be so high off the ground. I expect you will need a sump tank of some sort. Some backup systems would be a good idea since loss of power if you have 500 fish in a single 2000 gallon tank those fish could be belly up in a matter of hours in warm weather during a power out if you don’t have backup supplemental aeration. I have 300 gal. FT, 4 half barrel GB’s,With Gravel for media. Oct 3 I got 50 channel cat fish. three or four are turning on there side while swimming. I have heard of it called flashing,and maybe parasites. PH 7.4, Ammonia .25, Nitrites 0, Nitrates 60 ppm,Water temp. 69 am-82 pm . I know I have to many for the GB area and I am working on that with another 200 gal FT. Do you have any advice. Need to go to Orlando in a month or so would like to meet you and see some of your ideals. AP has almost consumed my life I love this stuff and want to get better at it. You need more grow beds long before you need another fish tank. You are right you have way too many fish. Channel catfish can grow really BIG. When I stock my systems, I like to have at least 20 gallons of gravel bed to filter per fish in the system and 10 gallons of fish tank for each fish. Way too many fish and not enough filtration is kinda a recipe for disaster if what little filtration you have is not cycled up. Do lots of testing and only feed when the ammonia and nitrite are below .50 ppm. Channel catfish have sensitive skin and ammonia is really harsh for them. Big White patches are a sign of collumnaris disease that tends to flair up when the water quality isn’t good and they get stressed. The disease can progress to the point where the skin basically rots off and you can see flesh or even whole parts of the fish are gone. It is pretty terrible to whitness but about all I know to do is try to keep stress and handling to a minimum, perhaps salt a little bit, keep the water quality as good as possible and remove any fish that are dead or slow enough that you can net them without freaking out all the other fish or hurting the healhty fish with the net. Net injuries to otherwise healthy fish can prompt an infection. Not a noob to gardening or raising Catfish individually. But combining them commercially leads me to one big question. What we are trying to achieve is sort of a Plant/Fish Garden of Eden. Has there been a study done on the ratio of Fish to Plant. With tons of variables that effect both Plant and Fish Growth. I would Assume the Formula at some points come down to the amount of Food consumed by the fish vs Plant requirements for Nitrates. To many fish the fish suffer vs Not enough fish the plants suffer. Has any University researched this ratio and provided guidelines? Not like we can easily add “Extra” fish or plants to balance the equation. Is there a Repeatable “Sweet Spot” for an established system? Most of the university research about aquaponics and the fish/plant ratio has been done on tilapia at the University of the Virgin Islands. The ratio is really more to do with the amount of feed compared to the amount of plants but there are many variables that will affect how the ratio plays out. For instance, some types of fish require a higher protein feed than others and some types of plants use a lot more nutrients than others. Also climate, temperature, and light availability play a big roll in how a system all balances out. A system in the tropics may largely run about the same no matter what the season while a system up near the 45th parallel is going to run very differently during the different seasons. Now an important aspect to keep in mind when balancing a system is that there is a 3rd element of the system that you haven’t even mentioned RPGDDS. The Filtration. The exact balance of plants to fish and fish to plants doesn’t matter quite as much as one might think on first glance provided the filtration is robust and more than ample enough to support whatever amount of fish is in the system to keep the water quality good for the fish and to convert the needed amount of nutrients for the given amount of plants. A system without the bio-filter bacteria and any other filtration needs will NOT function well at all no matter how perfectly you balance the amount of plants to the amount of fish feed. If the filtration is robust and healthy for the size system, it is possible to run a system without fish or without plants temporarily or in some cases, permanently provided something is substituted for the roll of either the fish or the plants. In recirculating aquaculture they do water changes to substitute for the plants. In Bio-ponics or organic hydroponics, they use some form of organic nutrient input to substitute for the fish/fish feed. So trying to repeat a “sweet spot” that was found in one system might be difficult unless you are trying to repeat it under identical conditions as the original system. Like with almost any growing or farming, you will need to fine tune your system to your specific requirements and situation. Rules that apply to tilapia might not apply the same to Channel Catfish and definitely differ for Trout. What works for X farm using Y feed might not work for Z Farm using H feed. 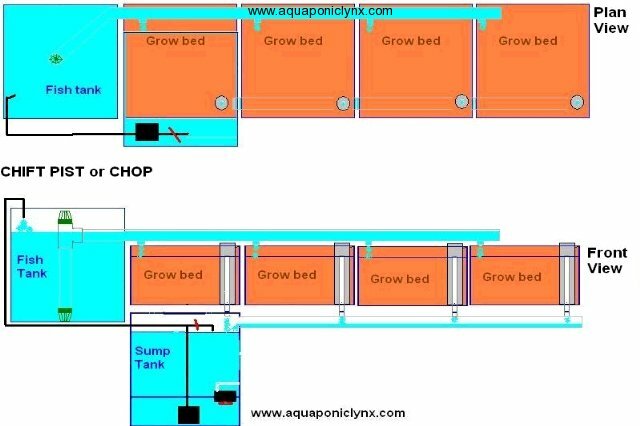 Hi, can you tell me what type of license for Florida( if there is one) for selling the produce of our aquaponics,currently we have lettuce and herbs, It’s is a small scale of 6 rafters system 5’x 50′ feet long with 3 tanks of tilapia. Hi,can you tell me what type of license for Florida( if there is one) for selling the produce of our aquaponics,currently we have lettuce and herb. It’s is a small scale of 6 rafters system 5’x 50′ feet long with 3 tanks of tilapia. As far as I’ve ever been able to figure out, to sell produce from your garden. Fresh, whole and unprocessed directly to the end users like at a farmers market or farm gate sales you do not need a license. The inspectors for chemical residue testing would like to know about you so that they can buy samples of your produce to run chemical residue tests on it but they have a heck of a hard time finding all the farms since there is no licensing for selling fresh unprocessed produce direct to the end customers. However, if you do any washing or processing of any produce, you need to have an approved food processing facility and that does require inspection and certification and fees. If you are going to sell fish, you need to get an aquaculture certificate. And with Tilapia you would need the conditional species permits as well. Any processing of the fish also requires the food processing facility regulations be followed. If you are going to use a scale, you need to use an approved scale, get a permit for it and have it inspected yearly. If you are going to sell seedlings or live plants you need a nursery inspection. If you are going to sell water plants you not only need the nursery inspection but also the aquaculture permit. I am new to this whole aquaponics system and I have been slowly over the last year “mind-designing” an aquaponics system for use as a supplemental food supply for my family of six. I was hoping to get some input on whether my setup should be flood/drain or constant flow. I have planned a 1100gal FT 700gal sump(if needed) and a 13’x13’x1′ grow bed all housed in a 16×24 greenhouse.I was looking to stock roughly 60-80 trout/catish in this system to start and increase as plants require. With flood and drain you have to make sure your system can handle the water level fluctuations. With only a single huge grow bed, all that fluctuation would happen all at once all the time so a rather large sump tank would be required. How are you going to access the plants in a 13′ by 13′ grow bed? How would you build it and support it so that it could drain into a sump or fish tank (to do flood and drain the grow bed needs to be at least a tiny bit higher than what it is draining into.) Also, large tanks sunk in the ground either need to be insulated or you need to make sure your ground temperatures are appropriate for your desired fish. The Earth is not an insulator, it is a giant thermal mass. If your average ground temperature happens to be perfect for your desired fish then great but if you live in a location where the ground temperatures are in the 40’s or 50’s F through the winter, it will actually make heating water even more difficult. I probably wouldn’t try to keep trout and catfish in the same system since trout like the cold water and catfish like warm water. Catfish usually quit eating when the water gets down to about 55 F though they will survive down to almost freezing as long as the temperature doesn’t drop too fast. Trout will like water between 50-65 F while the bacteria for the bio-filtration would prefer the water be above 65 F. And will be at it’s peak when water temps are in the 80s F. Catfish will grow best when water is between 80-86 F but they eat and grow well anywhere between 65-90 F. I don’t really know much about keeping Trout other than they need lots of filtration, water flow and aeration as well as water that doesn’t get too warm and high protein feed. I usually like to have more grow bed volume than I have fish tank volume. A cubic foot of media per Max weight of 1 lb of fish and turning over (pumping) the total volume of your fish tank per hour are some of the rules I go by. Keep in mind that channel catfish can get large (well over a pound) under good conditions and so can trout though if you are trying to keep both together, I suspect you will have trouble getting either one to grow anywhere near their full potential. As to constant flow/flood or flood and drain, most plants seem to like flood and drain a little better but it means you need to handle the water level fluctuation. Constant flow/flood minimizes the water level fluctuation problem but you then have to make sure your grow beds are not getting clogged up. Single extra large grow beds may have a bigger problem with slime build up at the water inlet and water starting to flow over the top of the gravel, especially if trying to turn over large amounts of water through only a single grow bed. I believe such a system will need some supplemental solids filtration and removal. Just because a system might be able to temporarily support a max weight of fish, that doesn’t mean you need that many fish to keep the plants happy nor that the system will be able to support that max weight of fish constantly without supplemental filtration. For a single 169 cubic foot grow bed the MAX fish load would be 169 lbs of fish. I usually recommend that to mean that your MAX number of fish if you ONLY plan to grow them to 1 lb each is 160 or so fish. If they are fish that might grow to 2-3 lb then you have to stock LESS fish even when they are small. I don’t like to stock any more than about 100 channel catfish for grow out in a 1000 gallon tank, any time I have stocked more for anything longer than a quarantine period, I’ve run into disease problems. And that is assuming there is enough grow bed or filtration to support those 100 fish. I don’t know much about trout but I don’t think I would recommend stocking them any more dense than channel catfish. 60-80 fish is probably a fine max number for a new system. Especially if you get it cycled up fishlessly before getting the fish. I would then say if in your second year of growing you feel confident about keeping more fish than that perhaps it would be ok but if you have to ask how many fish, the answer is always LESS. I often recommend starting a little smaller with perhaps a 300 gallon fish tank size balanced system to learn the ropes and decide how you want to build the next system better. Once you build your next system the 300 gallon system winds up being your “Quarantine system” for new fish when you get them so you can avoid possible introduction of parasites or diseases into your larger fish population. I would also probably recommend separate fish tanks at least if you want to keep both trout and catfish in the same system, this is mostly due to logistics if you are trying to harvest just one type of fish, since you don’t want to be accidentally netting/injuring fish you don’t intend to harvest and catfish are especially prone to getting sick from net injuries because they have no scales and abrasions from nets and the stress from harvesting operations can leave them open to several diseases. Also, the best feed for catfish is different from the best feed for trout. Thanks for the reply. I guess I should have mentioned how I was planning the set up. If I go Flood/Drain the FT will be placed on ground level, it is 6’x7’x’4 Ferro-cement tank.Beside FT will be a 5’x5’x4′ Ferro-cement sump placed in 4′ in ground.The grow bed will be a 13’x13’x1 4″ concrete slab with Ferro-cement outside wall filled with local river gravel/expanded shale.It will be situated on the ground as well. The concrete slab will have a 2 1/2″ drain on the bottom leading to the sump. If I was doing the constant flood the sump would be removed and replaced with another growbed that also houses the pump to return water to tank.FT and main G.B would remain. As for accessing the plants, I had planned on actually walking on the grow bed allowing spacing between plants to do so.This way I gain extra filter media/bacteria maker. This will all take up appr. 12×19 space if grouped against each other.Allowing me some room to play with. Also the wall of the green house will be easily removable PVC panels, since they will not be needed in summer only winter. As for the fish I am still up in the air but leaning more towards rainbow trout as I live on the sw side of PA with temps going below freezing on occasion.So I will need some supplementary heating for the winter.Less for trout more for catfish. I do intend to build a smaller system here in the next month as my trial and error(quarantine tank) before starting this project sometime this summer/early fall. Just want to get my ducks in a squiggly line, so I know I am on the right track. Thank you again for your time answering my questions. Make sure you get a potable water safe pool paint or sealant for the cement or you will have pH issues. I still warn that you could have issues sending all the water from such a large fish tank growing fish like trout into just one media bed. The CHIFT PIST constant pumping system layout with only one grow bed has the drawback of sliming issues where the water enters the grow bed. 1100 + gph feeding into just one spot in a bad will definitely slime up. If you do a distrobution grid from such a tank, you will be cleaning the grid very often to keep it from blocking up and causing your fish tank to overflow. Keep these things in mind and possibly look up adding a Radial Flow Filter or something that might allow you to remove solids to a composting operation to feed soil gardens or worm bins. Water will be pumped from the sump to the fish tank. Water then then overflow from the fish tank into the grow beds where it will “flood and drain” back into the sump via syphons. My question is…will this kind of set-up work, particularly using the sump as raft bed? Yes it should work fine as long as you take into account keeping plant roots and leaves from clogging your pump and keep the drains from your grow beds from splashing over your rafts. Remember to stock your fish tank appropriately for your filtration, first season I would recommend only one fish per cubic foot of gravel bed then once the system is mature you should be able to adjust your stocking to also include some extra fish based on the raft bed filtration as well. It might make sense to have a separate air pump for the fish tank and another air pump for the raft/sump since balancing deep and shallow water aerators can be tricky. Thank you for your response and suggestions. I will put a screen around the pump to prevent roots and leaves from clogging it. I also intend to put some fresh water shrimps underneath the rafts to help in the cleaning. Shrimp being territorial, don’t expect to harvest many from a bed that size. With the screen around the pump, make sure it is not metal (unless stainless steel) and make sure it doesn’t slime or clog up which could essentially run your pump dry and destroy it. Thanks for your forum. Reading through has giving me lots of input. I live on a island off Vancouver island BC Canada. I am planing gold fish as my fish stock cause I’ve seen them survive through the winter in ponds and even rain barrels. I will continue to follow your advice through to completion thanks again.